Georgia’s first city, Savannah, is known for its natural beauty, magnificent architecture, quaint squares and rich history. When you’re ready to see all the best sights and attractions, climb aboard the Old Town Trolley and see it all in just 2 days! Old Town Trolley Tours of Savannah covers the entire city, highlights more than 100 points of interest and allows you to get on and off as often as you wish — giving you the chance to spend time at the places that are most interesting to you. Start 9:00 am – Start at the Visitors Center, housed in a once fully-functioning Georgia Railway station. Here, you’ll find more information on this history of Savannah, brochures, tickets for tours and more. Be sure to ask the eager-to-assist staff if you have any questions. – Start at Ellis Square where you’ll see the Savannah History Museum, the Civic Center, the Roundhouse Railroad Museum, Battlefield Park and the Ralph Mark Gilbert Civil Rights Museum. The Roundhouse Railroad Museum offers a great look at the history of the railroad in Georgia and is a quick tour; worth taking the short amount of time especially if you love antique trains. Stop #2 – Bull Street Corridor – Located on the intersection of Bull Street and Oglethorpe Lane, you’ll find a street aligned with various historical buildings like, the Independent Presbyterian Church. Stop #3 – Eat, drink and relive history! Hop off the Trolley here and enjoy true southern hospitality at Mrs. Wilkes Boarding House – a Savannah icon serving up delicious southern cuisine in family style dining. Then be sure to take a tour of the Green-Meldrim House, the Mercer House and Temple Mickve Israel. 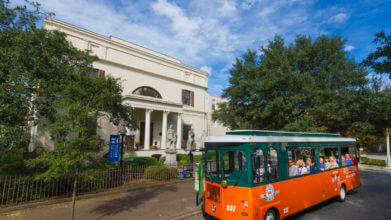 – The oldest and largest park in Savannah is a great place to get off the trolley and take a stroll. There are monuments, the famous Forsyth Fountain and 30 acres of natural beauty. The Victorian District is also here, where you can view many exquisite homes. – Grab your seat on the trolley at the nearest stop to your hotel and enjoy another day of great Savannah attractions and sites. Stop #6 takes you to the Cathedral of St. John and the Colonial Park Cemetery – two very historic and popular places that are on the list of Must Do’s in Savannah. Stop #9 – The Pirate’s House - Hop off the trolley and enjoy a stroll through the colonial district. Cobblestone streets, colonial homes and mansions will delight you as will the magnificent hundred-year-old oaks. Then stop in at the Pirate’s House for a delicious Southern lunch and historic, seafaring atmosphere. Near Stop #9 – The Waving Girl, True Southern Hospitality – Stroll down River Street, see the Olympic Torch statue and then see the Waving Girl statue in Morrell Park – Florence Martus greeted every ship that entered the Savannah port for 44 years, and her statue is one of Savannah’s most well known historic landmarks and a lasting tribute to her charming hospitality. And visit the many shops and restaurants along this beautiful pedestrian thoroughfare. Stop #7 – City Market – City Market is a busy, vibrant stop, home to various museums, unique shops, restaurants, pubs and art studios. While here, stop in to the prohibition museum as it is the only one in the country, a must-see Savannah attraction. Stop #14 – Franklin Square - Named for Benjamin Franklin, this lovely square is a great place to hop off and check out the antique stores, have a snack or simply window shop. The Ships of the Sea Museum and the First African Baptist Church are also here. After just 2 days, you’ll have seen the most well-known Savannah sights and attractions aboard the Old Town Trolley!